What is the cranial cruciate ligament (CCL)? The cranial cruciate ligament (known as the anterior cruciate ligament, or ACL, in humans) is one of several ligaments in the stifle (knee) that connect the femur (thigh bone) to the tibia (shin bone). The CCL has 3 main functions: (1) prevent cranial displacement of the tibia in relation to the femur (cranial drawer sign) (2) prevent hyperextension of the knee, and (3) prevent internal rotation of the tibia. 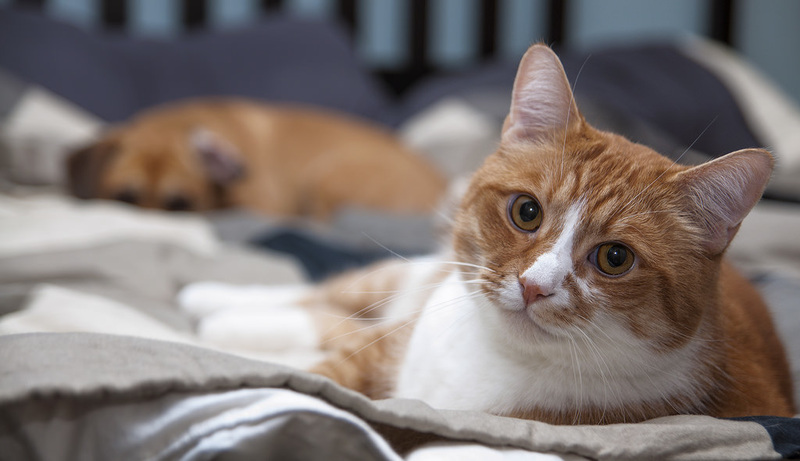 This commonly is seen in dogs but can also happen to cats as well. Why does the CCL rupture? Unlike human athletes, rupture of the CCL in dogs is rarely the result of a traumatic injury. Rather, animals tend to experience CCL “disease”, meaning that the ligament degenerates or weakens over time due to genetic, conformational, and/or immune mediated processes within the joint. The weakened ligament may partially or completely rupture following activities such as running or jumping. Unfortunately, the condition leading to CCLR is often present in both knees, and about 30- 50% of dogs will rupture both CCLs within 1-2 years of each other. CCL rupture is one of the most common orthopedic disease seen dogs, and CCL repair is the most common orthopedic surgery performed by veterinary surgeons. Are any other parts of the joint affected when the CCL ruptures? Quite often, yes. The medial meniscus (MM) is a fibrous pad attached to the top of the tibia that acts as a cushion inside the joint (there is also a lateral meniscus, but it is less often injured). The MM can be injured at the time of CCLR, but is more often damaged after prolonged instability of the stifle joint. Without the support of the CCL, the femur puts abnormal pressure on the MM which can lead to tearing or shredding of the meniscus. What signs will I see if my dog ruptures a CCL? There are three potential scenarios that can occur with CCLR: acute rupture, chronic rupture, and partial tears. 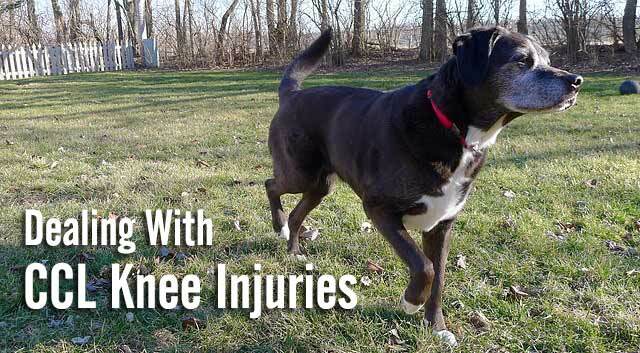 Acute rupture: your dog will likely be painful and partial to non-weight bearing lame in the affected hind limb. The lameness will likely improve over the next several weeks, however a sudden worsening may be seen if the MM becomes damaged, and your dog will not return to normal function without some evidence of lameness. An audible clicking or popping may be heard if the MM is torn. Chronic CCLR: an inciting incident may not have been noticed, but persistent lameness is evident. Over time, the body tries to stabilize the stifle by surrounding the joint with scar tissue. This will look like a swollen knee and range of motion of the joint may be compromised. Arthritis will develop inside of the joint as a result of chronic instability. Partial CCL ruptures: are less obvious—your dog may appear lame with exercise, but improves with rest. However, the ligament will continue to weaken and the joint will become increasingly unstable. Eventually, the ligament will likely rupture completely and lameness will not improve with rest. How will a veterinarian diagnose a ruptured CCL? The diagnosis of CCLR is typically based on the presence of the “cranial drawer sign”. In order to feel this, you dog will be placed on his/ her side, and the veterinarian will feel the knee for cranial drawer motion. This procedure is not painful; however, some dogs may be too tense to allow thorough palpation. If this is the case, a sedative may be given in order to complete the examination. Patients with chronic ruptures associated with a large amount of scar tissue and arthritis may not exhibit cranial drawer. 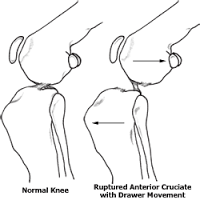 Other signs of CCL rupture include “medial buttress” (thickening or scarring on the inside of the knee), and “tibial thrust” (another method to check for cranial displacement of the tibia). X-rays will also be taken in order to rule out other potential causes of hind-limb lameness and to evaluate the extent of arthritis within the joint. Surgical stabilization of the stifle joint is the treatment of choice for complete CCLR in dogs. In addition to surgery, physical rehabilitation will be recommended and Low Level Therapeutic Laser Therapy is included with our surgeries. There have been many different procedures described in order to treat CCLR. No procedure completely halts the development of arthritis within the joint, but surgical stabilization is believed to result in better functional results than conservative therapy alone. The success rate with surgery is about 90% (meaning that most dogs return to good or excellent function following surgery and proper post-operative care). Dr Matt is trained and has been performing Extra-capsular stabilizing surgery since 2009. There are other surgical options available if needed such as the TPLO or TAA and the doctors will discuss with you to edit.